Hylotelephium telephium or Sedum telephium (orpine, livelong, frog's-stomach, harping Johnny, life-everlasting, live-forever, Midsummer-men, Orphan John, Witch's Moneybags) is succulent perennial of the family Crassulaceae native to Eurasia. The flowers are held in dense heads and can be reddish or yellowish-white. 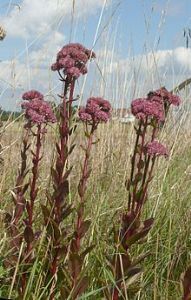 A number of cultivars, often with purplish leaves, are grown in gardens as well as hybrids between this species and the related Hylotelephium spectabile (Iceplant), especially the popular Sedum 'Herbstfreude' ('Autumn Joy'). Occasionally garden plants may escape and naturalise as has happened in parts of North America as wildflowers. Notable 16th century English herbalist John Gerard had remarked that live-long is full of vivacity. His remark is substantiated by the fact that when a stalk of the plant is cut and placed in clay, it would remain green for several days even without any watering. Over the ages, live-long has been a thing of superstition owing to its opposition to dehydrate and die. In effect, in earlier times, people believed that keeping the live-long plant in one's home would make certain that the people of the house remained healthy. People in the Scandinavian regions planted the live-long on their rooftops with a view to protect against lightening. Then again, if the live-long plant kept at home died all of a sudden, superstitious people would become apprehensive about the imminent death of a person in the household.